Since I'm on parental leave (Or more correctly, completely busy taking care of my children.) it is only fitting that my first real blog post should be dedicated to one of my leisure time interests, lightweight backpacking , and more specifically to my favourite piece of gear: The Bushbuddy woodburning stove. Warming baby food in Liljansskogen, Stockholm. Even a trip to a park can become a small adventure with the Bushbuddy. Andy Howell comments on the site that it is the best piece of gear that he has ever bought. I agree with him. I am an incurable firebug and the Bushbuddy allows me to make a fire almost everywhere with litte effort. There is something about making a fire that connects you with ancient man and fills you with inner peace. The idea behind this stove is that you can cook your meals using fuel that you collect in the surroundings, instead of carrying it with you. This can save a lot of weight if you are on a longer trip. You also save money since you don't have to buy fuel. In the long run this alone will pay for the stove. Weight and economical savings is not the main reason I like the Bushbuddy though, it is the pleasure I get from succeeding in making a fire in different surroundings, the joyful hunt for good fuels and the beauty of the double burning flame. Use dry fuel - Obvious perhaps, but even with experience I often fail here if I'm short on time. It usually pays to look longer and find some twigs that are really dry. Use small size pieces in the beginning - This is always the best for starting a fire. Once the fire gets going you can switch to larger sticks. I live in Sweden and mostly use the Bushbuddy in the forest. 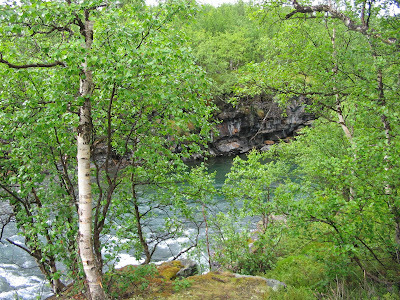 We have lots of spruce and pine and you can often find birch as well. With these trees around you really can't go wrong. With spruce in sight a fire can normally be started within a minute or two, regardless of weather. Just take the dead "crispy" small branches that sit next to the stem of tree. They are normally dry even after days of raining. If sufficiently dry they can be lit with a match without tinder. Once this gets going, it normally doesn't take more than a minute, continue with thicker (Less than 1cm wide) dry branches from the spruce. One or two branches is normally enough to boil a liter of water. The disadvantage of Spruce is that the fire can throw sparks. This seems to be less of an issue with small twigs. These small spruce trees are not very good as fuel, they are more adequate as christmas trees, but the roedeer is nice. An experienced hunter will also notice the antlers of the roebuck behind. This is more like it. A hare sitting next to enough spruce fuel for a dinner for 10! Pine is not as good as Spruce to start the fire, but it is better once the flames are strong. Again, collect the thinnest branches on the stem. These are not as well protected from the rain, so tinder is mostly needed. A special case of pinewood is the the so called "Fat pine". This is the king of all wooden fuels. A real pleasure to the senses. This is dry wood with a lot of resin in it. You can often find it in old dry stubs. The wood is slightly darker and has a nice turpentine smell. With a little whittling, you can make a feather stick with so thin "feathers" that it can even be lit with a fire steel. This requires a knife and some skill with the steel though. The dry pine cones are also excellent fuel and can be found a plenty when the weather is sunny. Birch is a lovely tree. It's bark has had a multitude of uses in the Nordic countries. It was used for roofs, shoes, backpacks, kitchen utensils and many other things. There is even a special word for it in Swedish, "Näver". Selling birch bark on rolls was even a major source of income in Swedish Lapland. It is the best fire starter that I know of. Just be sure to take the bark from dead trees, otherwise you damage the tree and it gets an ugly black mark, if it survives. When I find a good supply of birch bark I always try to stock up so that I'm sure to have some when I'm in a hurry next time. It does not weigh much anyway. Birch bark burns even when a bit wet, but is of course best completely dry. To use with a fire steel you need to rub the surface with a knife to make the sparks catch. Reasonably dry, thin, twigs also burn very well. They contain a lot of resin. Please keep in mind that making a fire and collecting firewood is not allowed in all places. Especially when the weather is dry it is often forbidden to start a fire, even in a Bushbuddy. You should only collect fuel from dead trees, and even this is not always allowed in some national parks. Please, DO NOT peel birch bark from alive trees. There are normally enough dead trees around anyway so you can get some from those. Good post on the BB and the fuel. I am like you, usually a bit in a hurry and thus also a slightly wet twig might land in the BB. Birch bark is fantastic, it lights so easily and quick, so its definitely a good idea to stock up on it when one finds a spot with plenty of it. 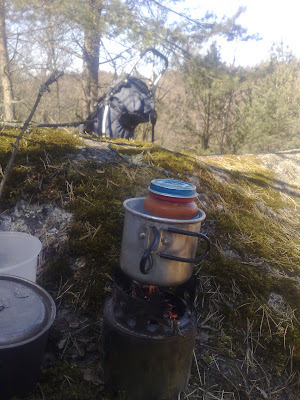 There's also the Solo Stove which is the same design as the bushbuddy but less expensive and a little heavier. Check it out at solostove.com.